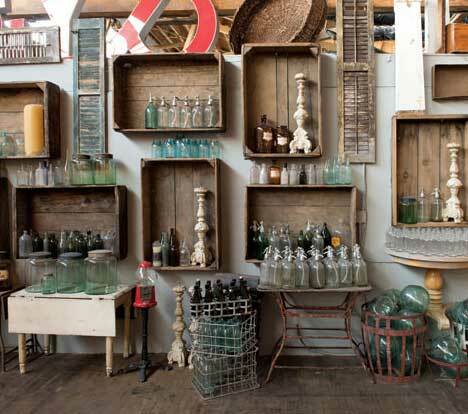 Found Vintage Rentals owner Jeni Maus became hooked on sourcing antiques when she began decorating her own home. But it wasn’t until she designed husband Joel’s photography studio (he’s the man behind the lens of Studio EMP) that the idea really took root. “A wedding coordinator came to my husband’s studio to look at albums, loved the space and simply said, ‘Have you considered renting to brides?’” says Maus. The next day, she filed for a business license and was off and styling. Three years later, Found Vintage Rentals is a bride’s and an event designer’s go-to destination. This past May, the company expanded from 3,700 square feet into a 13,000-square-foot space in Fullerton. And naturally, the 1926 historical building, the Elephant Packing House (affectionately called Elly by the Found team), is the perfect fit for Maus’ eclectic, Old World aesthetic. “My main goal is to create a cozy environment that is inviting and comfortable,” explains the petite Maus. Arriving at Found Vintage’s warehouse can be overwhelming, but Maus’ sales manager, Lauren McWilliams, is a pro at navigating the wide-eyed to the right pieces. “We try to learn what a couple’s style is and what pieces convey their personality,” Maus explains. “We show how our pieces can be used in a variety of different ways, and it doesn’t have to be done the same way as before.” And with Maus’ unwavering passion for finding unique items, brides are sure to find pieces that will make their wedding beautiful, memorable and downright lovely.